It has been a busy weekend. Not only did I get all these threads dyed, but I also finished winding all of my cones of thread. It’s pretty amazing to think that only a few months ago I bought 4kg of thread and now it’s all wound up into skeins and ready to go. Actually I think over the course of the last few months I have dyed about half of it. 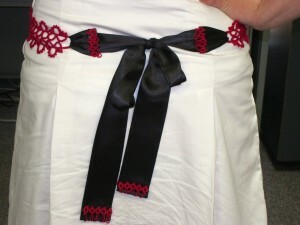 I’m hoping to dye most of the rest this weekend to take to the Shuttlebirds tatting workshop in Spokane. I’ll also be bringing them to KCamp Wannatat the following weekend. I’m really looking forward to that as well. It’s our first time at the new location. I’m sad that it won’t be at Bobbie’s familiar (and closer…) house, but I’m happy they’ve found a way to formalize it to keep Wannatat going and also have found a place that allows for a bigger group. More tatters getting together is always a good thing. The bane of my existence these days has been the tiny little burrs I find while winding thread. 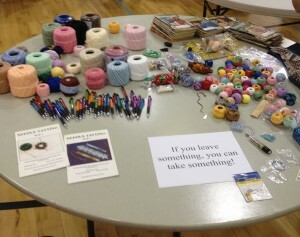 This last week I’ve been winding and winding and winding some more. 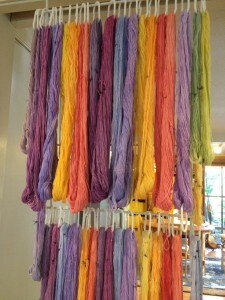 I’m hoping to actually get around to some actual dyeing of thread sometime this weekend. In the meantime, I wind lots of thread and end up cutting out lots of these little burrs so that my skeins can be as perfect as possible. They’re probably not actually perfect, but they’re as perfect as possible, so I’ll be happy with that. I should have taken a picture of my new awesome swift and the way I’ve set it up with a digital counter to track the skeins as I make them. I feel like this week I’m finally getting organized with the thread dyeing and I’m very excited about that. Lots to do before Shuttlebirds. I still need to take the pictures for the instructions for one of my classes, but otherwise I’ve got all my instructions in to Patti, so I’m feeling slightly more relaxed about the teaching stuff. If I get around to taking the time to get all my samples together into one place and ready to go then I’ll really be able to relax. Once everything for the teaching is done I’ll get to spend my time getting things ready for vending. Since no one is “counting” on me for anything there I can take it a little more easy and just get done what I can get done without stressing out. Four weeks till Shuttlebirds! Can’t wait! One of the classes I’m teaching at the Shuttlebirds conference this year is Photography for Tatters. 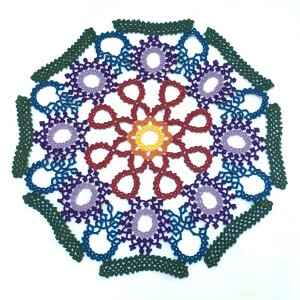 Just like with my Blocking, Starching and Care of Tatting class last year, I picked the topic because it was something I wanted to learn more about. My other hobby is photography, but in that area I’d call myself only a serious amateur and I have always been much more interested in landscapes than “product” photography. It’s definitely something I’ve always wanted to learn more about beyond the basics so I proposed this class to Shuttlebirds and they accepted it. A few months ago I put together a simple lightbox and we’ll go over how to make it in class. In further preparation I took a class two weekends ago at Wildfibers, an awesome yarn store in Santa Monica called Photography for Knitters, taught by Gale Zucker the author of the book Craft Activism and the blog She Shoots Sheep Shots. It was a great class and really clarified some of the stuff I’d been slowly figuring out on my own, as well as showing me a lot of stuff I probably never would have figured out. I loved seeing a bunch of pictures from shoots and hearing the logic that Gale went through in moving from one to taking another that was better to taking another that was better yet. 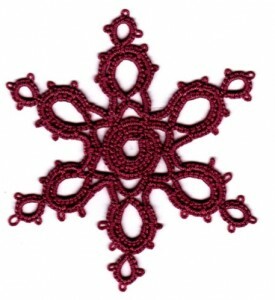 As soon as I have the time (probably after Shuttlebirds), I’ll be trying to put together some photo shoots of my tatting and I know it’s going to be helpful. Anyone in the Seattle area want to model for me? Hopefully, I’ve learned enough that my students in April will be able to learn from me. I’m really looking forward to the class. 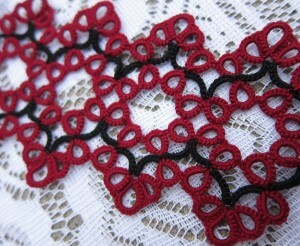 Choker Pattern Ready for Testing! 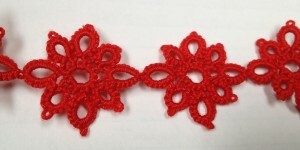 I haven’t done much tatting in the last couple days other than working on the second glove, but I did take a few minutes to update the pattern for the choker necklace that I’ll be teaching at Shuttlebirds this April. Anyone interested in test-tatting? 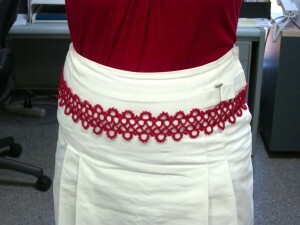 The pattern uses a non-double-stitch stitch (I use the lock stitch) and split rings. I’ll include the handout I wrote up a a few years ago for another class I taught of these fancy chains so you can use whichever one you’d like for the non-double-stitch stitch chain. 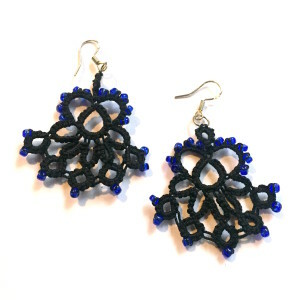 If you’re interested, send me an email at jessica@snapdragonlace.com or leave a comment. Btw, I have not come up with a better way describe that chain. 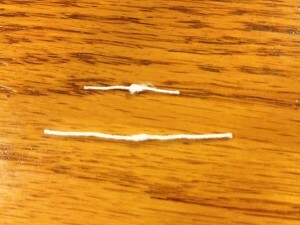 Non-double-stitch stitch chain. Any ideas? Basically, I’m trying to say a chain made of stitches that don’t curl like the regular double stitch does. 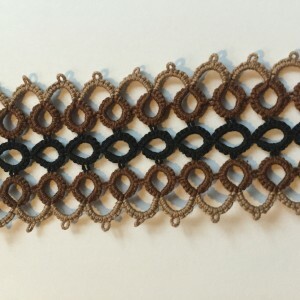 Lock-stitch chain, spiral chain, zig-zag chain, s-chain… Any of these would work and it doesn’t matter which one you use so I don’t like to specify any one in particular. I have decided to invent a new word for the tatting world. “Tattering” is what friend of mine used once when he couldn’t remember the word for tatting. I like it and I have decided that “tattering” is what you are doing when you are doing tatting-related things but are not actually tatting. 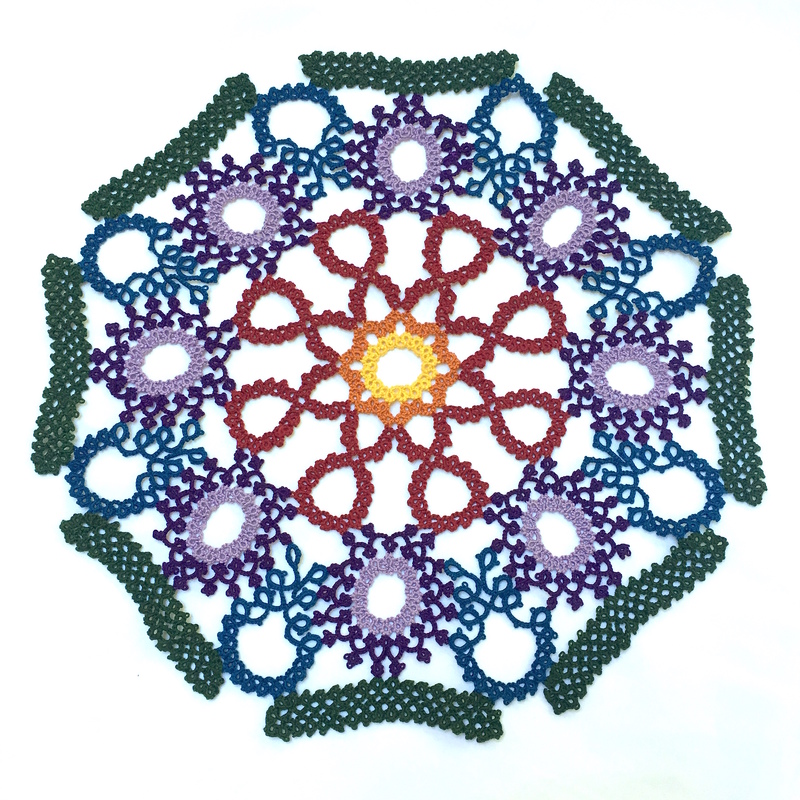 Sorting your thread stash, organizing your tatting books, writing up patterns, doodling tatting possibilities, blogging about tatting or just flipping through books daydreaming about patterns. All these things are tattering. Well, I have been busy the last couple days with some productive tattering. I am switching over to using Illustrator to diagram out my patterns so I spent yesterday afternoon learning how to use it and this afternoon writing up the handout and diagrams for one of my classes for Shuttlebirds. It took a very long time to make this fairly simple project, but I’m definitely getting the hang of the program. This particular pattern doesn’t have any chains which look like they might be slightly tricky so I still need to figure how to consistently draw those. That makes two of the five handouts finished for my shuttlebirds classes. (I am teaching Gina Butler’s chain of single-shuttle-dimpled hearts as one of my classes and using her handout for it.) Next step is to make another sample using my instructions and see if I catch any mistakes and then to find a couple test-tatters for it. 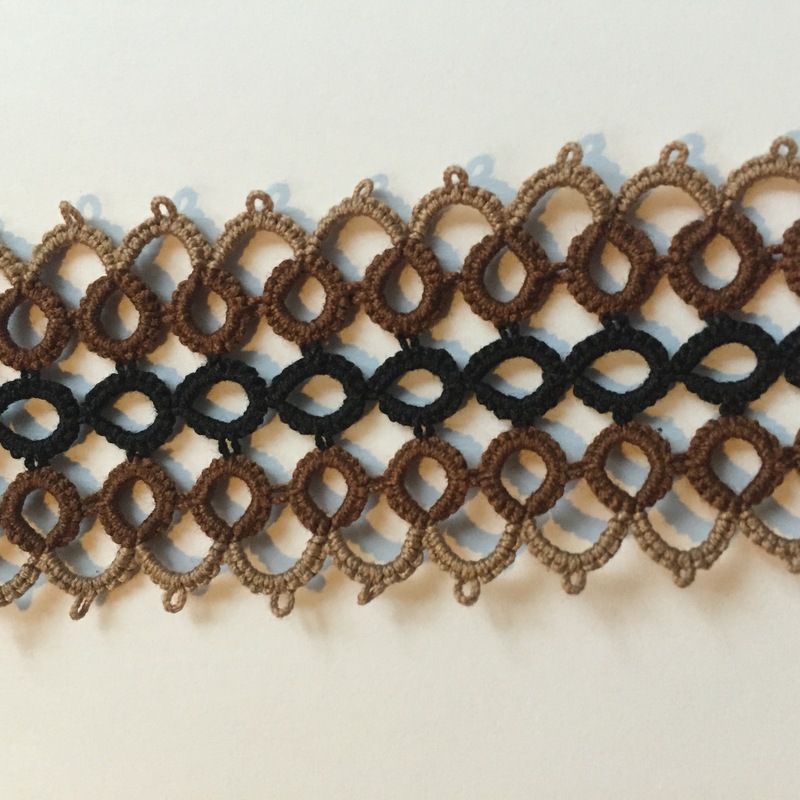 The pattern uses split rings and a lock-stitch chain (I also have instructions for the lock-stitch from a previous class that I can include with the instructions for the choker). 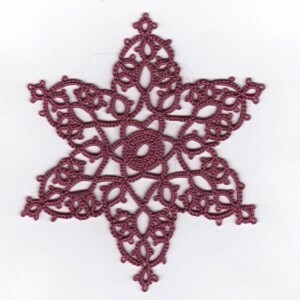 Let me know if you’re interested in test-tatting. I should have it ready for outside eyes in about a week or so. I am still trying to decide on proper usage of this word. Is one who is tattering a tatterer?